The PSoC 6 WiFi-BT Pioneer Kit (CY8CKIT-062-WiFi-BT) is a low-cost hardware platform that enables design and debug of the PSoC 62 MCU and the Murata LBEE5KL1DX Module (CYW4343W WiFi + Bluetooth Combo Chip). The PSoC 6 WiFi-BT Pioneer Kit features the PSoC 62 MCU: a dual-core MCU, with a 150-MHz Arm Cortex-M4 as the primary application processor and a 100-MHz Arm Cortex-M0+ that supports low-power operations, 1MB of Flash, 288KB of SRAM, 104 GPIO, 7 programmable analog blocks, 56 programmable digital blocks, Full-Speed USB, a serial memory interface, a PDM-PCM digital microphone interface, and industry-leading capacitive-sensing with CapSense. The PSoC 6 WiFi-BT Pioneer board offers compatibility with Arduino shields. The Cortex-M0+ is a primary core on the board’s SoC. It starts first and enables the CM4 core. The default configuration can be found in the Kconfig boards/arm/cy8ckit_062_wifi_bt_m0/cy8ckit_062_wifi_bt_m0_defconfig. The PSoC 62 MCU SoC is configured to use the internal IMO+FLL as a source for the system clock. CM0+ works at 50MHz, CM4 - at 100MHz. Other sources for the system clock are provided in the SOC, depending on your system requirements. The PSoC 62 MCU SoC has 9 SCB blocks 8 of each can be configured as UART interfaces for serial communication. At the moment UART5 on SCB5 and UART6 on SCB6 are configured. SCB5 is connected to the onboard KitProg2’s USB-UART Bridge, SCB6 to P12_0, P12_1 pins on the J3 of the Arduino Uno R3 compatible PSoC6 I/O header. 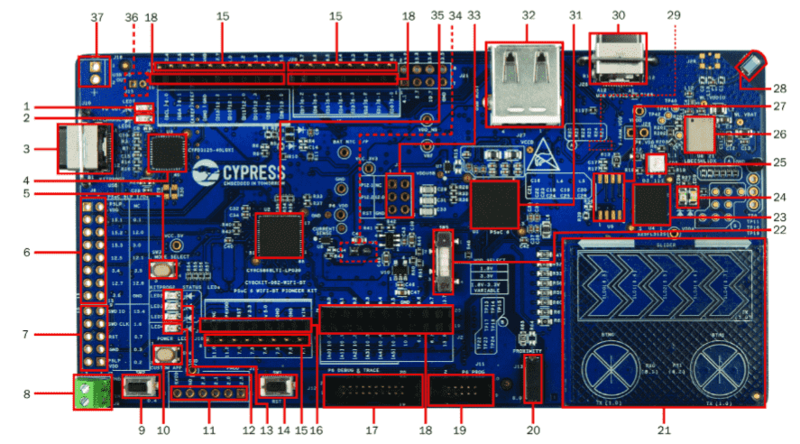 The CY8CKIT-062-WiFi-BT includes an onboard programmer/debugger (KitProg2) with mass storage programming to provide debugging, flash programming, and serial communication over USB. There are also PSoC 6 program and debug headers J11 and J12 that can be used with Segger J-Link. A watchdog timer is enabled by default. To disable it call Cy_WDT_Unlock() and Cy_WDT_Disable(). -c "reset_config srst_only;reset run;psoc6.dap dpreg 0x04 0x00;shutdown"